SONORA, Calif. - A man in California is lucky to be alive after police said a convicted felon kicked in the door of his hotel room, robbed him and left him tied to a toilet, reports CBS Sacramento. "I heard a... bang, and the door flew open and the door frame came flying off," said the man, identified by the station only as "Kevin." 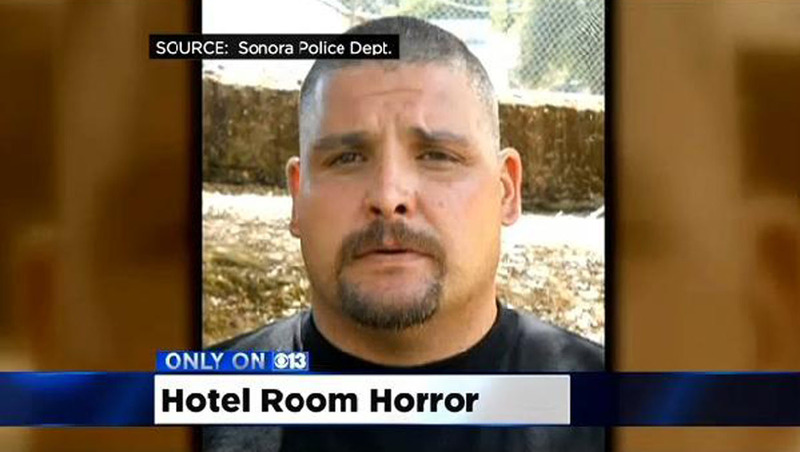 The victim was staying at the Inns of California hotel Wednesday in Sonora, Calif., part of Tuolumne County. Kevin told CBS Sacramento that the masked robber, later identified as Ramon Diaz, pointed a gun at him and told him not to make a sound. "[He] looked at what I had and started telling me to put all kinds of electronics in my laptop bag," he said. Though Kevin said he complied with the orders, the suspect wasn't taking any chances. "He tied my hands behind my back, with my hands up against [the toilet], and then tied the rest of the rope around. Tied a towel around my mouth and neck so I wouldn't make any noise." Police said Diaz used Kevin's rental car to flee the scene. An hour later, he reportedly used the victim's credit card to buy gas. The suspect found the car parked outside a home in the Tuolumne area less than six hours after the crime was committed, and Diaz was taken into custody. Investigators said the suspect has a lengthy criminal past and that he was on parole for a recent burglary conviction. Police said Diaz cut off his GPS ankle bracelet and kicked in the doors to several other, unrented rooms at the hotel before finding Kevin. "It didn't seem like his first time," Kevin told CBS Sacramento. "It was going too smoothly, but at the same time it seemed like there were plenty of holes where he could get himself caught." Kevin said he would say a prayer for the man who robbed him and shoved a gun in his face. "I almost felt some sort of sympathy," he said. "People who do this kind of thing are either really sick or really desperate. It must be a dark place to be." The hotel manager told the station that he's worked there for 14 years and never seen anything like what happened to Kevin. Indiana police say probe of girls' unsolved murders takes "new direction"